Bachelor of Medicine and Surgery by the Complutense University. Madrid. 1993. Completion of the Doctoral Program in Surgery at the Complutense University of Madrid with Recognition of Investigation Aptitude. 1995. Postgraduate training: Specialist in Plastic and Reconstructive Surgery via MIR at the Doce de Octubre Hospital in Madrid. April 2001. First place of Specialist in Plastic and Reconstructive Surgery, elected in Madrid at the 1996 MIR competition. Complementary training in The Division of Plastic Surgery in Toronto General Hospital and Mount Sinai Hospital in Toronto in 2000. Lecturer of the subject of Plastic and Reconstructive Surgery “Salus Infirmorum” College of Nursing Graduates. Pontifical University of Salamanca. Courses 1999-2000 and 2000-2001. Section Head of the Unit of Plastic Reconstructive and Aesthetic Surgery. Madrid Montepríncipe Hospital. From May 1, 2001 to July 31, 2003. 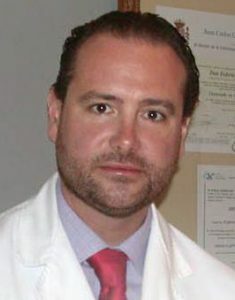 Acting Head of Department of Plastic and Reconstructive Surgery at the Cruz Roja Central Hospital, Madrid. From November 2001 until January 2002. Head of service of Plastic Surgery at the Beata Maria Ana Hospital, Madrid . From November 2001 until December 2012. Service member of Plastic and Reconstructive Surgery and Burnt Unit Department, Getafe University Hospital, Madrid. From January 2002 to October 2006. Consultant surgeon and surgeon of the international team of professionals at MENTOR from 2009 to 2010 and at ALLERGAN from 2011 to 2012. Consultant Surgeon of the International Medical team of Mentor Corp Laboratories (California) 2009-2010. Consultant Surgeon of the International Medical team of Allergan Laboratories (California) 2011-2012. November 2010, Vitoria, Brazil: Congress of the Brazilian Society of Plastic Surgery. March 2011 Dubai, Mammary Augmentation Surgery. June 2011 Stockholm, Sweden: Beauty Through Science. September 2011, San Jose, Costa Rica: News in Plastic Surgery. September 2011, Mexico, Querétaro: Congress of the Mexican Society of Plastic Surgery. October 2011, Heidelberg, Germany: Meating of European experts in Plastic Surgery. November 2011, Bucharest, Romania: Master Class with mammary augmentation surgery live. December 2011, Milan, Italy: Meeting of Experts in Mamary Reconstructive Surgery. October 2012, Zagreb, Crocia: 9th Congress of Plastic Surgery. August 28 to 29, 2013, Bucharest, Romania: Plastic Surgery Expert Meeting. Mayo 23 to 24, 2014, Salo, Italy, 9th International Course on Advanced in Breast Augmentation Techniques.